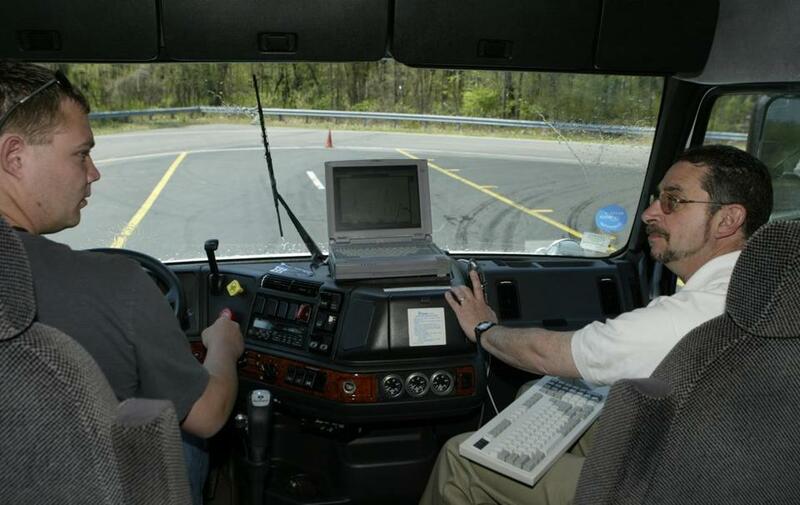 Part of the worker safety research conducted at the Hopkinton site involved a driving course in tractor-trailer decision making, shown above. Other research focused on workplace injuries such as falls, carpal tunnel syndrome, and the various type of impact of repetitive tasks. Liberty Mutual is shutting down its research arm in Hopkinton that for six decades put it at the forefront of workplace injury prevention, prosthetic limb development, and the push for safer car features, including collapsible steering columns. The company will no longer conduct peer-reviewed research, considered the gold-standard for studies, which extended its reach worldwide. The research influenced occupational safety guidelines that were widely used to prevent injuries in the workplace. Up to 44 employees, mostly scientists and researchers, could be laid off when the company ends the program on June 6, John Cusolito, a spokesman for the Boston-based insurance company said. While Liberty Mutual could see some savings from ending the program, it is likely to have a small impact on the company’s bottom line. It reported a profit of $351 million during the first three months of this year, down 11 percent from the same time last year due to bigger wind and hail storm losses. When Liberty Mutual founded the research facility in 1954 it was one of few organizations studying injuries in the workplace and on the road. But since then many more outlets are researching workplace issues, Cusolito said. And the nature of work has changed as well. More people are working remotely or in shared spaces and manufacturing now involves robots doing assembly line work, Cusolito said. And other organizations and universities are better positioned to do that kind of research, he said. Liberty Mutual will focus its research efforts on partnerships with universities that are involved in workplace studies, Cusolito said. The company helps fund work at the Harvard T.H. Chan School of Public Health, the University of Massachusetts Amherst, UMass Lowell, and MIT. “We will use funds to continue and create partnerships with organizations and specialists that give us the flexibility to tap into research studying the evolving ways that people are living and working,” Cusolito said. Liberty Mutual was among a handful of insurers that ran their own research centers. The institute focused heavily on workplace injuries — falls, carpal tunnel syndrome, and the impact of repetitive work — because Liberty Mutual began as a workers compensation insurer covering railway, shipbuilding, and tannery workers hurt on the job. As recently as 2012, Liberty Mutual was the largest workers compensation insurer with $4.2 billion in premiums, according to the Insurance Information Institute, a trade research organization. But by 2015, the most recent data available, Liberty Mutual had fallen to fifth in market share with $2.5 billion in premiums. Over the years it has expanded into auto and home insurance and other commercial lines. It has also scaled back its workers compensation business, as rising medical costs and state regulations cut into profits. Tom Leamon, who served as director of the research institute for safety for 16 years until 2006, said its closure is disappointing. The research that its scientists conducted — bringing in people to lift containers of different sizes to measure the impact on their bodies, or evaluating the best way to grasp tools such as knives and screwdrivers for long periods — was published in scientific journals and accessible to everybody, including competitors, Leamon said. Working with MIT in the early 1960s, researchers helped develop the first battery-powered prosthetic elbow, called the Boston Elbow. Holliston-based Liberating Technologies Inc., a manufacturer and distributor of prosthetic devices, started out as a project of Liberty Mutual, until it was spun off as an independent company around 2001. Liberty Mutual’s research institute was influential in safety and health research, said Jordan Barab, former deputy assistant secretary of the US Occupational Safety and Health Administration in the Obama administration. The company not only provided insurance when people were injured, but did significant work in trying to reduce those injuries, in part to reduce the costs of claims, Barab said. Liberty Mutual also developed a strong pipeline with researchers at universities and knew the latest academic work being done and where to direct financial support, he said. Liberty’s decision to end its research arm comes as many government agencies are facing potential budget cuts in the new Trump administration, which could hurt their ability to do research on work safety. Liberty Mutual will keep open the Hopkinton facility, where driver training programs and classes for claims adjusters will continue.